, a once celebrated Italian poet, was born at Naples in 1569; and made so great a progress in his juvenile studies, that he was thought qualified for that of the civil law at thirteen. 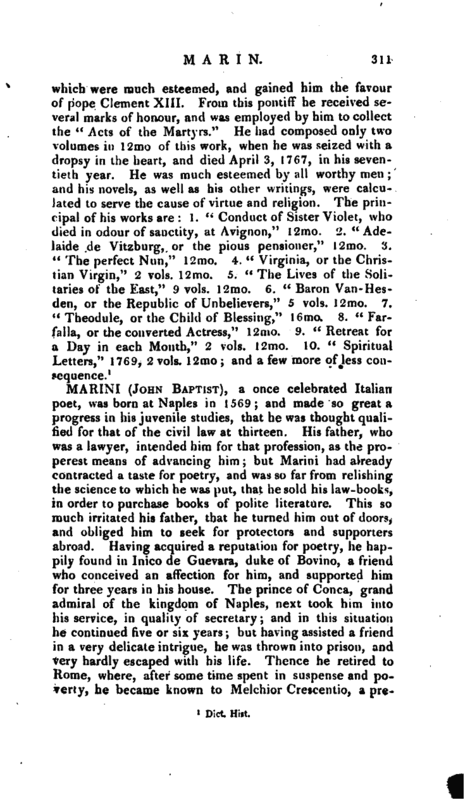 His father, who was a lawyer, intended him for that profession, as the properest means of advancing him; but Marini had already contracted a taste for poetry, and was so far from relishing the science to which he was put, that he sold his law-books, in order to purchase books of polite literature. This so much irritated his father, that he turned him out of doors, and obliged him to seek for protectors and supporters abroad. Having acquired a reputation for poetry, he happily found in Inico de Guevara, duke of Bovino, a friend who conceived an affection for him, and supported him for three years in his house. The prince of Conca, grand admiral of the kingdom of Naples, next took him into his service, in quality of secretary; and in this situation he continued five or six years; but having assisted a friend in a very delicate intrigue, he was thrown into prison, and very hardly escaped with his life. Thence he retired to Rome, where, after some time spent in suspense and poverty, he became known to Melchior Crescendo, a | prelate of great distinction, who patronized him, and provided him with every thing he wanted. In 1601, he went to Venice, to print some poems which he dedicated to Crescentio; and after making the tour of that part of Italy, returned to Rome. 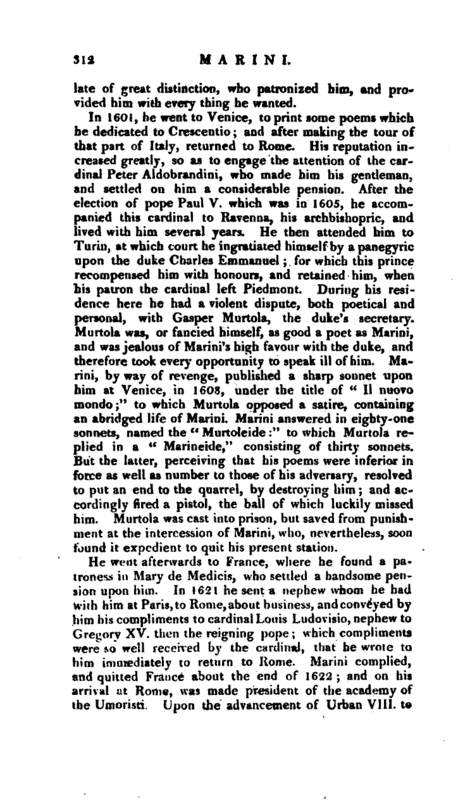 His reputation increased greatly, so as to engage the attention of the cardinal Peter Aldobrandini, who made him his gentleman, and settled on him a considerable pension. After the election of pope Paul V. which was in 1605, he accompanied this cardinal to Ravenna, his archbishopric, and lived with him several years. He then attended him to Turin, at which court he ingratiated himself by a panegyric upon the duke Charles Emmanuel; for which this prince recompensed him with honours, and retained him, when his patron the cardinal left Piedmont. During his residence here he had a violent dispute, both poetical and personal, with Gasper Murtola, the duke’s secretary. Murtola was, or fancied himself, as good a poet as Marini, and was jealous of Marini’s high favour with the duke^ and - therefore took every opportunity to speak ill of him. Marini, by way of revenge, published a sharp sonnet upon him at Venice, in 1608, under the title of “II nuovo mondo;” to which Murtola opposed a satire, containing an abridged life of Marini. Marini answered in eighty-one sonnets, named the “Murtolelde:” to which Murtola replied in a “Marineide,” consisting of thirty sonnets. 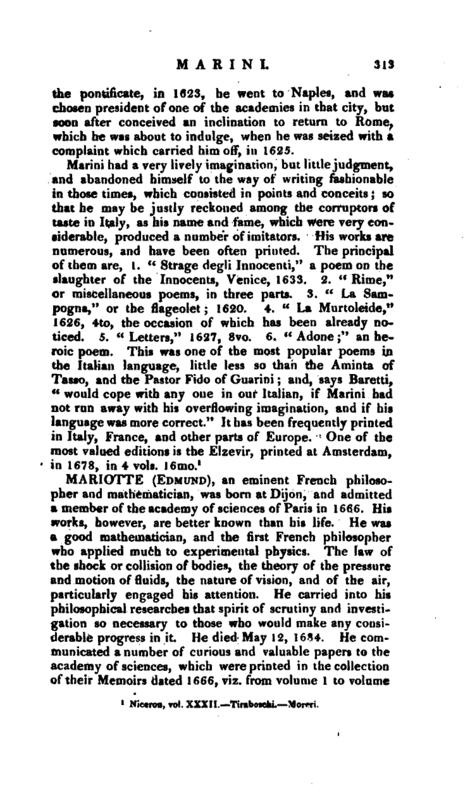 But the latter, perceiving that his poems were inferior in force as well as number to those of his adversary, resolved to put an end to the quarrel, by destroying him; and accordingly fired a pistol, the ball of which luckily missed him. Murtola was cast into prison, but saved from punishment at the intercession of Marini, who, nevertheless, soon found it expedient to quit his present station. He went afterwards to France, where he found a patroness in Mary de Medicis, who settled a handsome pension upon him. In 1621 he sent a nephew whom he had with him at Paris, to Rome, about business, and conveyed by him his compliments to cardinal Louis Ludovisio, nephew to Gregory XV. then the reigning pope; which compliments were so well received by the cardinal, that he wrote to him immediately to return to Rome. Marini complied, and quitted France about the end of 1622; and on his arrival at Rome, was made president of the academy of the Umoristi. Upon the advancement of Urban VIII. to | the pontificate, in 1623, he went to Naples, and was chosen president of one of the academies in that city, but soon after conceived an inclination to return to Rome, which he was about to indulge, when he was seized with a complaint which carried him off, in 1625.